We spend so much time on our quilt tops and then all too often write off the quilting phase - throw some stippling on it, or hand it off to a long-arm quilter - I do it all the time. But I've decided I want to be more involved in the quilting process. One of the most impressionable quilting books I've ever owned is "Quilting Makes the Quilt" by Lee Cleland - long out of print. The purpose of the book was to show you just how different a quilt can look based on the quilting. The book features multiple identical quilts - Lee made the same top 5 times - and then quilted each one with a different design - it is amazing to see how dramatically the quilting can alter the appearance of the quilt. If you ever run across a used copy of the book I suggest you add it to your collection. This is one of my quilts that I am currently working on - a friend of mine, Christine, named it Snowballs in Spring because of the snowball border. I think I'll stick with the name, but I certainly hope it's not the forecast for our spring - enuf with the white stuff! 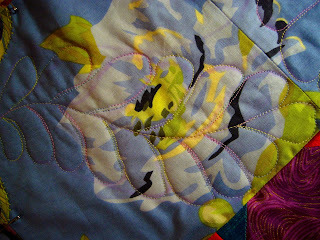 I'm at the quilting stage, and I really wanted to do some interesting quilting to highlight the overall piecing design. I've taken many machine quilting classes, most recently with Philippa Naylor - an amazing quilt artist from England. 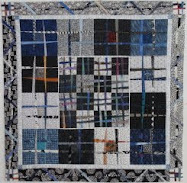 Her machine quilting is simply extraordinary - every stitch controlled and calculated. This would be my feather quilt - I will conquer my fear of feathers - no more aimless wandering and meandering - this quilting would have purpose, add an extra dimension of interest. Round One: OMG - how pathetic! 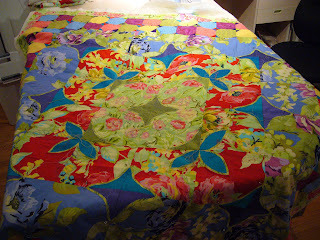 Quilt Police, I surrender - tar and feather me - all of these years of quilting, of classes, multiple books and tutorials and this is the best I can do??? 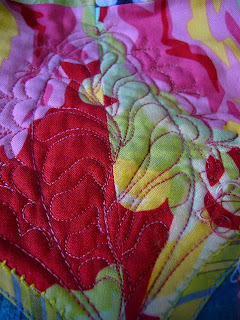 WAIT - can you believe I actually kept quilting these feathers in some vain belief that the more I quilted the better they might look - that all the stitches would fall into place when I finished and they would look "right"? What was I thinking? I pity the poor bird that gets stuck with my feathers - it has no hope of ever taking flight. Back to the drawing board and the seam ripper - all traces of my first attempts must be removed. Pull out the books, stack up the practice sandwiches - I will not ruin this quilt with shoddy quilting. And, I will not relinquish this quilt to yet another stippling experience. Don't get me wrong - stippling and fill has it's place, and I'm very good at both, but I want to master ("master" might be a strong descriptive here - I'm not completely at the edge) more technical quilting techniques. Deep breath - I can do this. When I first started machine quilting years ago all of the instructors encouraged you to move fast - keep the quilt moving. Well that may be fine for meandering, but when you want to incorporate some meaningful quilting motifs, you need to slow the speed down, significantly. Move slowly, and reposition your hands often. 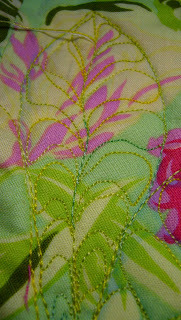 I always sew with my needle in a down position - that way when I stop sewing my needle is in the quilt holding it steady. I've learned that when I resume sewing it is best to lift the needle before taking the next stitch to be certain your quilt hasn't shifted. While these feathers are not perfect, they are dramatically improved. I'm finding the larger the feather, the easier it is for me to get the best results. 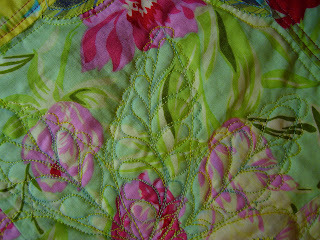 You're going to see a lot more of this quilt as I progress with the quilting phase. I have no aspirations to become an incredible machine quilter, I just want to move it up a notch or two. I think it will be a good learning experience for me.